In the early days of our journey together, back in late 2012, the Coaching Story founders sketched out – literally, on a paper napkin, in a coffee shop! – a draft model that describes our distinctive approach to coaching. our wider work in helping to promote ʻcoaching culturesʼ in organisations and local communities throughout the world. Intriguingly, as we talked and scribbled, we found an hourglass graphic taking shape before our eyes. Very appropriate for a coaching conversation! In future blog posts we will describe in detail the elements of the model, and their relationships. We will share, too, a full glossary of the highlighted words included in the commentary below. This month weʼll keep to a quick overview, as a taster of what is to follow. The Coaching Story model is represented by an hourglass. The top half represents the ʻCoaching Containerʼ: the personal, private interactions between the Coach and Coachee, who work together as Allies. During this confidential growth period, the Coach aims to skilfully Structure time and space to enable the Coachee to search for, explore and give Expression to their ideas and truths, and for them both to Hear accurately the emergent Story. In any coaching engagement, there comes a Threshold point, a discovery or insight, when the work within the session (or sessions) leads to the impetus for action (or actions) by the Coachee outside the Coaching Container. the spirit of the relationship between Coach and Coachee should be that of potential Reciprocity: not only are both gifting each other their time and authentic presence, but also all ʻgood Coaches make willing Coacheesʼ. These transient titles are roles, not fixed identities, and their positions might be reversed in future. The qualities of humility and generosity are modelled and honoured throughout the Coaching Story process. The Coach aims to set the tone of the coaching by being Real, Present and to engage by Witnessing as the Coachee seeks and explores their truths, and works to find their authentic voice to express them. By being open, attuned and non-judgemental, the Coach accompanies the Coachee on their journey of discovery: not acting as a leader, or a teacher. The Coach might bring knowledge and understanding of how a Coachee might find or seek out appropriate resources, internally and externally, but the focus of the sessions remains exclusively on the direction of travel, and desired destination, set (and revised) by the Coachee. The role of the Coach is not passive. In order for them to act as an “advocate for the coacheeʼs best self” they will need the Courage to Challenge the Coachee to dig deeply for the truth to their Story. This, again, acts as a positive model for the Coachee to continue their self-coaching. Importantly, as coaching requires commitment and energy from both Coach and Coachee, the Coach will need to ensure that they are equipped with the internal and external resources they need for coaching sessions to be Reviving, rather than depleting, for both participants. Weary, worn-down coaches might inadvertently lead to the telling of tired, threadbare old stories. 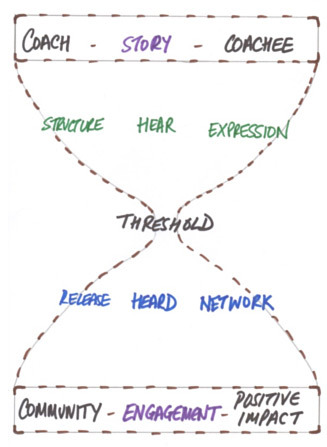 The bottom half of the hourglass represents the ʻCommunities of Interestʼ: the wider, relevant world into which the truths and stories discovered and voiced within the Coaching Container might be shared. The key to understanding the work ʻabove and beyond the coaching sessionʼ is how Coaching Story can help foster meaningful and willing Engagement between the Community (geographical, or of interest) and the Coachee, the bearer of the Story, to bring about a Positive Impact of social change for individuals or groups. This is the true story of the impact of Coaching Story. We believe coaching is a powerful tool to build ways of genuinely listening and responding to ʻquieter voicesʼ in communities worldwide. We hope you enjoy being part of our story.